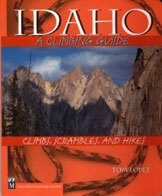 Bloomington Peak is a large conical mountain just east of the crest of the Idaho portion of the Bear River Range. It is about 9 miles west of the small town of Bloomington, Idaho and sits at the head of Bloomington Canyon and forms the divide between the South and Middle Forks of it. Bloomington Peak offers exceptional views of the entire Bear River Range with every major peak visible except Logan Peak, in Utah. It has the best view of Paris Peak by far and also offers and amazing view of Bloomington Lake and St. Charles Mountain which are on the opposite side of Bloomington Canyon. Although this peak is not technically difficult it does offer a rewarding and beautiful climb. All approaches are relatively smooth except for the north side which is nearly vertical in some places and offers a series of cliff bands and rugged rock. There is a large cirque at the base of the north side. Climbing from this direction could offer many more challenges and could border on a class 3 climb in some places. The most feasible route would be from the south. There is no trail and the brush is quite thick in some places so it will be a bushwhack from any direction. The base of the mountain is at about 8000 ft. from all directions so there is a little more that 1300 ft. of elevation gain in less than a mile. In June of 1998 there was a severe storm which, amazingly, produced a tornado in the upper-central portion of Bloomington Canyon. The tornado ripped down several square acres of timber and left the area nearly treeless. The Forest Service opened the area for logging to clean out the dead timber and what was left after that was burned. For this reason you will see a lot of uprooted and burned stumps in this portion of the canyon. The only way to easily get to this peak is from the East via Bloominton Canyon Road. Bloomington Canyon is large and broad, especially near the western end. It is one of the most popular destinations in the Bear River Range because it contains Bloomington Lake so the road has been improved and is in very good condition for its entire length. The peak lies about 9 miles to the west of Bloomington,ID. You will pass the Paris Peak trailhead (which has restrooms)on your way to the South Fork of Bloomington canyon. The road will divide in the area with a lot of fallen and cleared timber due to the tornado. Take the left hand fork going to the southwest to get to an area called Telegraph Flat and the south ridge of Bloomington Peak. This road also takes you to Bloomington Lake if you continue. There will be a gate on this road a little past the division but it is always open during the summer. Take the right hand fork to go strait west into the Middle Fork of Bloomington Canyon to climb the north face from the cirque. From the South Fork road turn off when you get to a large meadow at the base of Bloomington Peak. This is Telegraph Flat. You can park here as well and begin the climb up the south ridge. The Paris Peak Trailhead no longer has restrooms, only a large trailhead signboard and a small corral for horses. While the statement is made that “the most feasible route would be from the south”, no specifics are provided. 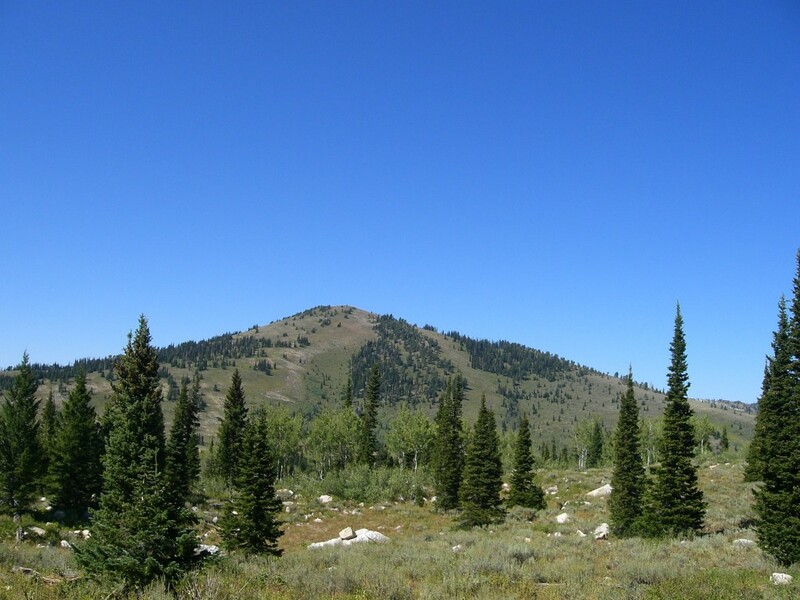 This is a big mountain and, on its southern aspects, the mountain has shoulders, gullies, open terrain (desert scrub), and sections of forest (pines and/or aspens). There are many ways to skin this cat from the south, but none are specifically discussed. Drive up Bloomington Canyon Road/FSR-409 from Highway 89 at the south end of Bloomington, ID. At 7.9 miles, turn LEFT to stay on FSR-409. At 10.3 miles, you reach Telegraph Flat at a road junction with FSR-1064/Telegraph Flat. The elevation at this road junction is 8,037 feet. From the road junction at Telegraph Flat, bushwhack NNE through tall, thick desert scrub and a few short sections of thick aspens to reach the Southeast Spur at 8,250 feet. Scramble NW up the rounded spur on open terrain (thick desert scrub) to reach much easier, sparser, shorter scrub at 8,700 feet. Continue climbing NW to reach Point 8960+ at a ridge juncture. At this juncture, the Southeast Spur and the Northeast Ridge join to form the summit’s East Ridge. Unlike the ridge and spur leading up to it, this juncture is forested. Turn L/W at this juncture and enter a short section of forest that is thick with blowdown and desert scrub. Drop 20 feet to a minor saddle then continue westward from the saddle onto open terrain (more desert scrub) on the L/S side of the ridge crest.Weave around adroitly to avoid the thickest of the scrub. You will even find a short section of embedded talus/scree and minimal scrub—this is a blessing, but it doesn’t last for long. 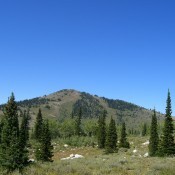 Continue your westward grind up thinner scrub to reach the summit of this large mountain. The summit of Bloomington Peak is just a minor hump. Several ground boulders protrude modestly above the ground and serve as the high point. The highest of these boulders is the true summit and has a small cairn atop it. I added a few more pieces of talus to the summit cairn but found no summit register. When viewed from afar (e.g., from the top of Saint Charles Mountain), Bloomington Peak seems to have a tall cairn atop it. It has no such thing. What you are seeing is a nearby 10-foot tall pine tree with two trunks! Same as for the Southeast Spur/East Ridge Route. From the summit of Bloomington Peak, you have a birds-eye view down the South Face. To descend the South Shoulder, the line of descent aims straight at a road junction on Telegraph Flat Road/FSR-1064 about 0.6 miles SW of the 8,037-foot road junction you are parked at. There is a prominent gully directly to the E of the South Shoulder. This gully becomes more evident after you descend 300-400 feet from the summit. The South Shoulder is somewhat ill-defined and, many times, feels more like a face. But, as the USGS map shows, it IS a legitimate shoulder, albeit a gently rounded one. This descent is entirely in open terrain. There is no forested section as the USGS map suggests. You will wish there was some forest to work through because the open terrain is tall, thick desert scrub right from the top. It is relentless and has no game trails or cattle trails in it until you get down close to the road, where you will probably see a herd of cattle hanging around a stinky watering hole. There were a few sections of easy terrain (embedded flat rock or good gaps in the veg), but not many. As you near the road, the scrub thins out and cattle trails show up. Once you reach the road (FSR-1064), hike NE on it for 0.6 mile to return to the junction with FSR-409.